A neonate with a double aneuploidy associated with congenital heart defect (CHD) suffered from cyanosis after birth. He had typical features of Down syndrome (DS) including hypertelorism, slightly lowset ears with protruding pinna. Doppler echocardiography indicated complex congenital heart disease with an ostium secundum atrial septal defect, enlarged right ventricle, and mild tricuspid valve regurgitation. 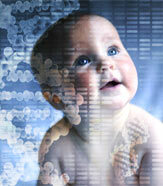 Further chromosomal analysis showed a karyotype of 48,XXY,+21: a double aneuploidy of DS and Klinefelter syndrome (KS). Until now, only seven cases of double aneuploidy associated with CHD defect have been reported.